Boo is arguably the Bay Area’s (and perhaps the world’s?) cutest canine. Following the perfectly coifed Pomeranian’s dainty outfits and quirky adventures has been a favorite pastime of ours — can you blame us? We think not. Just check out the recent snaps of Boo helping the lucky folks at Virgin America and you’ll see why he’s the captain of cuddly. What we wouldn’t give to share a plane with this pooch. So, when the toy-making experts over at Gund released a super-adorable stuffed animal modeled after our fave furry friend we totally bought one…for everyone we know. Now Gund wants to give your pup the Boo treatment, too. 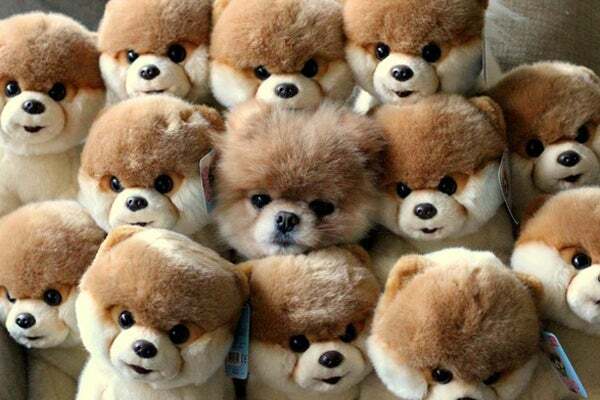 The stuffed animal-making company is holding a competition to find the next “Top Dog” to be immortalized as a limited-edition toy! If you think your hound could give Boo a run for his money bones, submit a photo of your Fido to win the title of "Most Beautiful Dog," "Ugliest Dog," "Doganista," "Best-Dressed Dog," "Dog That Most Resembles Its Owner," or enter him in all of the above! The contest runs from now until August 15 with the tail-wagging winner crowned the week of August 27. Upload your pup’s pics or just ogle the cuteness overload here! And to add to the mutt mania, Gund will also be holding a “Most Pinteresting Dog Contest” on Pinterest. The pooch to receive the most likes on the Gund Pinterest board will receive a bevy of Gund goodies valued at $250. Now that’s something to bark about!